For other ships with the same name, see German submarine U-52. German submarine U-52 was a type VIIB U-boat of Nazi Germany's Kriegsmarine during World War II. She was initially ordered on 15 May 1937, in violation of the terms of the Treaty of Versailles, and laid down on 9 March 1938, at the yards of Friedrich Krupp Germaniawerft AG in Kiel as yard number 587. Launched on 21 December 1938, she was commissioned on 4 February 1939, under the command of Kapitänleutnant (Kptlt.) Wolfgang Barten. German Type VIIB submarines were preceded by the shorter Type VIIA submarines. U-52 had a displacement of 753 tonnes (741 long tons) when at the surface and 857 tonnes (843 long tons) while submerged. She had a total length of 66.50 m (218 ft 2 in), a pressure hull length of 48.80 m (160 ft 1 in), a beam of 6.20 m (20 ft 4 in), a height of 9.50 m (31 ft 2 in), and a draught of 4.74 m (15 ft 7 in). The submarine was powered by two MAN M 6 V 40/46 four-stroke, six-cylinder supercharged diesel engines producing a total of 2,800 to 3,200 metric horsepower (2,060 to 2,350 kW; 2,760 to 3,160 shp) for use while surfaced, two BBC GG UB 720/8 double-acting electric motors producing a total of 750 metric horsepower (550 kW; 740 shp) for use while submerged. She had two shafts and two 1.23 m (4 ft) propellers. The boat was capable of operating at depths of up to 230 metres (750 ft). The submarine had a maximum surface speed of 17.9 knots (33.2 km/h; 20.6 mph) and a maximum submerged speed of 8 knots (15 km/h; 9.2 mph). When submerged, the boat could operate for 90 nautical miles (170 km; 100 mi) at 4 knots (7.4 km/h; 4.6 mph); when surfaced, she could travel 8,700 nautical miles (16,100 km; 10,000 mi) at 10 knots (19 km/h; 12 mph). U-52 was fitted with five 53.3 cm (21 in) torpedo tubes (four fitted at the bow and one at the stern), fourteen torpedoes, one 8.8 cm (3.46 in) SK C/35 naval gun, 220 rounds, and one 2 cm (0.79 in) anti-aircraft gun The boat had a complement of between forty-four and sixty. U-52's first patrol began with her departure from Kiel on 19 August 1939, well before the outbreak of war. She crossed the North Sea and headed for the Atlantic Ocean via the 'gap' between Iceland and the Faroe Islands. The most southerly point of the patrol was reached on 1 September, the same day that Germany began the invasion of Poland. After a series of short trips from Kiel to the German-administered island of Helgoland, (also known as Heligoland) and then Wilhelmshaven, the boat left Helgoland on 27 February 1940 and arrived at Wilhelmshaven on 4 April. Three days later, U-52 began her third sortie. It was very similar to her second; but success continued to elude her. She crossed the North Sea and swept the area between the Faroes and Shetland Islands. Having sailed in a southerly direction to the west of Ireland, the boat sank The Monarch 60 nautical miles (110 km; 69 mi) west of Belle Ile in the Bay of Biscay on 19 June 1940. Moving further into the Bay, U-52 came across the Ville de Namur. At first the Germans were under the impression that large wooden structures on deck were for weapons, when they were stables for horses. Nevertheless, the vessel was sunk; she went down in five minutes. She also sank the Hilda on 21 June and the Thetis A. on 14 July. The latter vessel had already been attacked, but the torpedo used malfunctioned, (a common occurrence in the early months of the war). Foray number five was in terms of tonnage sunk, her most successful; she destroyed the Gogovale on 4 August 1940 about 300 nautical miles (560 km; 350 mi) west southwest of Bloody Foreland (County Donegal in Ireland). On about the same day the submarine was badly damaged by British escorts; repairs took four months to implement. Her tally rose steadily with the demise of the Tasso and the Goodleigh on the same day (2 December 1940). Both ships went to the bottom about 360 nautical miles (670 km; 410 mi) west of Bloody Foreland. 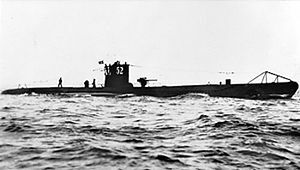 Continuing her hunting in mid-Atlantic, U-52 sank the Ringhorn on 4 February 1941 and the Canford Chine about 165 nautical miles (306 km; 190 mi) southwest of Rockall, (a tiny outcrop), on the 10th. There were no survivors from the second ship. She sank the Saleier on 10 April 1941. According to 'Uboat.net', the ship went down in 15 seconds but there were 63 survivors. Her last recorded victim was the Ville de Liège, a Belgian-registered vessel which was successfully attacked about 700 nautical miles (1,300 km; 810 mi) east of Cape Farewell, (southern Greenland) on 14 April. 14 July 1940 Thetis A. ^ a b c d e Helgason, Guðmundur. "The Type VIIB boat U-52". German U-boats of WWII - uboat.net. Retrieved 8 December 2014. Helgason, Guðmundur. "The Type VIIB boat U-52". German U-boats of WWII - uboat.net. Retrieved 8 December 2014. Hofmann, Markus. "U 52". Deutsche U-Boote 1935-1945 - u-boot-archiv.de (in German). Retrieved 18 February 2015.